Rearranging furniture has been a hobby of mine since I was a little girl. I blame my Grandma for teaching me by example. I've carried this habit/hobby with me into adulthood and even though we live in a tiny apartment in Orange County, the urge to redecorate still creeps up on me every now and then. And working from home the majority of time doesn't help the frequency at which these urges occur. Because of space constraints and the shape of the rooms in our apartment, it makes it difficult to rearrange furniture. But certainly not accessories and wall decor. Hey everyone, Jeff here. She's right, I did not want to paint the wall. Again. Because I know one wall isn't just one wall. It's one wall and wall decor. That aside, (unfortunately) I have to say that it looks a lot better than what we started with. 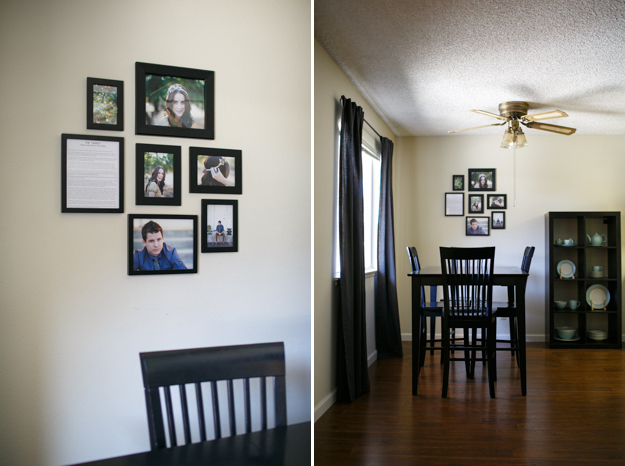 We weren't planning on changing the photos on the wall, but when we saw how dark everything looked with the gray paint and existing black frames, I was in agreement that a change needed to occur. We've been meaning to do a specific craft for a while now (see the painting of the tree) so this seemed like the perfect opportunity and the rest of the wall decor followed suit. 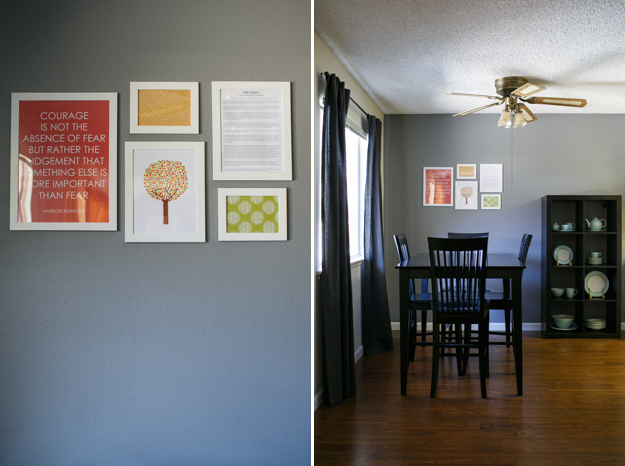 We'll be sharing specifically how we created the tree painting and more specs about the wall decor on Wednesday's post. I'm in love!! Can't wait to learn more about that amazing tree.. it's so lovely. Well done you two!